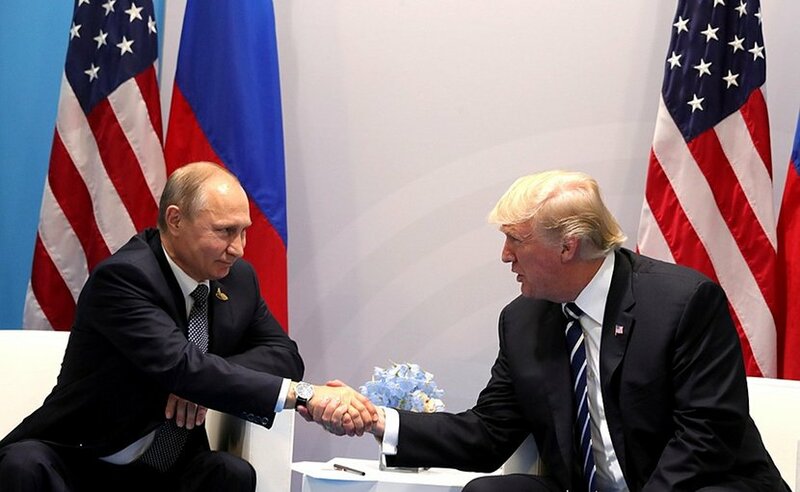 Throughout the summer, public opinion has been diverted by US threats to launch new overseas wars, France’s rhetoric about forming a post-Brexit, Berlin-Paris pact, which will remake the European Union, and Brazil’s President Michel Temer’s corruption and crime scandals. These superficial controversies will be overwhelmed by fundamental class conflicts, which promise to alter the present and future structural relations within Western capitalism. President Trump proposes to enrich capitalists and intensify class inequalities via his radical transformation of the tax system. Corporate taxes will be cut in half; overseas corporate taxes will be abolished; and wage and salaried workers will pay more for fewer social benefits. Trump can count on the support of the Republican leadership, business and banking elite and sectors of the Democratic Party in his plans to roll out a massive tax giveaway for the billionaires. Trump’s cabinet, led by the Goldman Sachs trio and his troika of generals will ensure that the budget will include slashing the funds for education and health in order to increase military spending, expand wars and cut taxes for the rich. Even more aggressive threats against North Korea, Russia, Iran, Venezuela and China, greater overseas war spending and troop levels in Afghanistan and the overt militarization of policing, immigration control and domestic intelligence will result in drastic cutbacks on federal programs for the poor and working classes. Declining access to quality health care for workers and deterioration in workplace safety conditions will fuel the opioid addiction epidemic leading to hundreds of thousands more premature worker deaths by overdose, injury and inadequate, incompetent care. In France, the workers and middle class face the most comprehensive attack on their employment rights and progressive social legislation in modern history. President Emmanuel Macron has declared his goal of completely transferring socio-economic power from French workers to capital by gutting all pro-labor laws and protections. Employees will have to negotiate with their bosses, one plant and one office at a time, thereby undermining the collective bargaining power of a united working class. Employers will be free to hire and fire workers with virtually no restrictions or consequences. Temporary and short-term ‘garbage’ contracts will proliferate, destroying long-term worker stability. Macron will eliminate the jobs of over 100,000 public employees while slashing corporate taxes by over $50 billion euros. In contrast to massive tax cuts for the bourgeoisie, Macron proposes to increase taxes on French pensioners, hitting millions of retirees. Once in place, Macron’s legislative agenda will concentrate power, profits and wealth of capital while increasing inequalities and class polarization. Responding to the economic interests of the bankers, Macron promises to lower the deficit to 3% of GDP through massive cuts in health and education. Under the pretext of ‘reducing unemployment’, Macron will promote part-time and temporary employment for French youth and immigrant workers, stripping all French workers of their hard-fought gains in job security and labor rights. Macron justifies his assault on labor by dismissing workers as ‘lazy’. Michel Temer, Brazil’s ‘unelected’ President plans to privatize 57 public enterprises – the crown jewels of Brazil’s economy. This will amount to the biggest capitalist asset grab in two centuries! 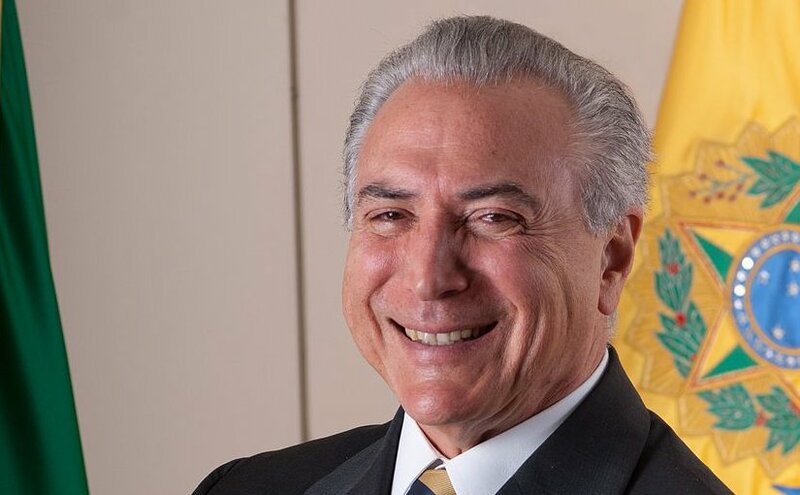 Brazil’s Michel Temer. Photo by Licurgo Miranda, Wikipedia Commons. Included in the sell-off are: oil fields, energy transmission lines, highways, airports, as well as Brazil’s mint and lottery. Electrobas, Latin America’s biggest electricity generator, is up for grabs. In addition, Temer plans to raise interest rates charged by the state-owned development bank BNDES to increase the private bankers’ share of lending and profits. This naked grab of profitable state enterprises by private domestic and foreign investors will lead to the loss of hundreds of thousands of jobs and the lowering of wages, salaries and pension payments. Temer started to slash state pension liabilities by increasing the age of retirement by several years. Wages and social benefits have been frozen for the foreseeable future. Presidential decrees, which dictate the terms of labor contracts, threaten collective bargaining. These presidents have declared their intention to launch full-scale ‘class war from above’ – the consequences of which remain to be seen. The presidents, who rule by fiat, are treading fragile terrain. Each is facing major political, economic and social challenges. All three presidents have lost public support since taking power, especially among their lower middle and working class-class voters. Macron’s approval dropped from 65% to 40%; Trump from 49% to 35%; and Temer (who was not elected) barely retains 5% (and falling) public approval. Despite uncertainties over the regime’s stability and future, foreign investors and the financial press supports Temer. President Temer’s isolation from Brazil’s voting public has weakened his power in the Congress, and among the domestic banking elite and oil and power corporations. However, if the trade unions call for widespread militant strikes by manufacturing workers, public employees and the landless rural workers’ movement (MST) is effective and paralyzes the economy, Temer may be forced to resign before his program is implemented. Meanwhile, President Temer faces numerous judicial investigations for corruption. Strategically, Temer can count on international support, especially from the US State Department, Treasury, Pentagon and the European Union. The neo-liberal regimes in Argentina, Uruguay, Chile, Paraguay, Peru, Colombia and Mexico have voiced strong support for Temer, especially since they have also received bribes from the same Brazilian corporate oligarchs! Under Temer, the Brazilian economy has declined by over 5% since he took power in a ‘legislative coup d’état’. His budget deficit exceeds 9% and unemployment has doubled to over 11%. Despite support from foreign and domestic elite, Temer’s presidency will not survive. Under mass pressure and with looming elections, Brazil’s Congress may decide to allow the courts to prosecute Temer and block his proposed sellout of public assets. Credit rating agencies are going to downgrade the Brazil’s economy to ‘junk’ status, undercutting new investments. With new elections on the horizon in 2018, it is clear that Temer will not even run for the presidency and his proposals to privatize Brazil’s major firms may not succeed. The economic recession has sharply reduced tax revenues and the possibility of receiving any significant boost from privatization is dubious. Even Temer’s initial regressive measure – the slashing of public pensions- has bogged down in bureaucratic infighting. However, the opposition to Temer’s capitalist offensive has yet to strike a decisive, organized blow. The Congressional opposition, led by the center-left Workers Party (PT), is a distinct minority with many of its leaders facing their own corruption trials. The PT is incapable of blocking, let alone ousting, Temer. The rightwing opposition in Congress is divided between those who back Temer – based on party patronage – and those who want to replace Temer while pushing for his anti-labor agenda. The trade unions, led by the CUT, have mounted sporadic protests and made rhetorical gestures, while the MST (the landless rural workers) and associated ecological and homeless movements, which lack militant mass urban support, would be unable to topple Temer. Ex-President Lula Da Silva has regained some degree of mass voter support but faces corruption charges, which may ban him from political office – unless there is a major mass mobilization. In sum, the rightwing, pro-capitalist offensive in Brazil is comprehensive — offering public assets and private profits– but weak in institutional support and economic fundamentals. A big-push from the Left could undermine the political base for Temer’s economic team, however, it is not clear which party or leaders would replace him. 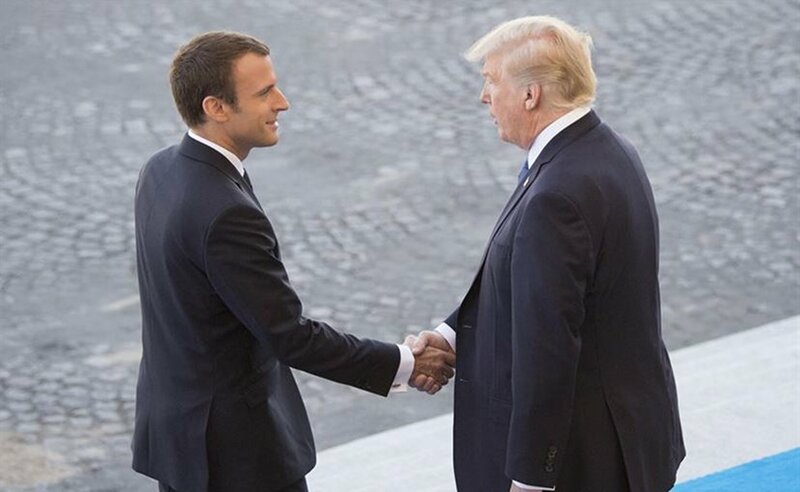 When President Emmanuel Macron was elected President of the Fifth Republic, he carried a mass electoral base as well as the support of France’s leading business and banking organizations. However, in the run-up to the launching of his capitalist offensive the mass base has evaporated. Voter disapproval is rising rapidly. The militant wing of the trade unions (CGT) prepares to launch general strike. His regressive tax agenda has alienated wide sectors of the petit bourgeois, especially public-sector employees. Macron’s concentration of executive power (his Bonapartist complex) has turned his allies on the right against him. The outcome of Macron’s offensive is both likely and uncertain. For one thing Macron enjoys a majority in the French Congress. The economy is growing and investors are exuberant. Tax-conscious small business groups are happy. Labor is divided with the class collaborationist CFDT and FO refusing to join with the trade union opposition. 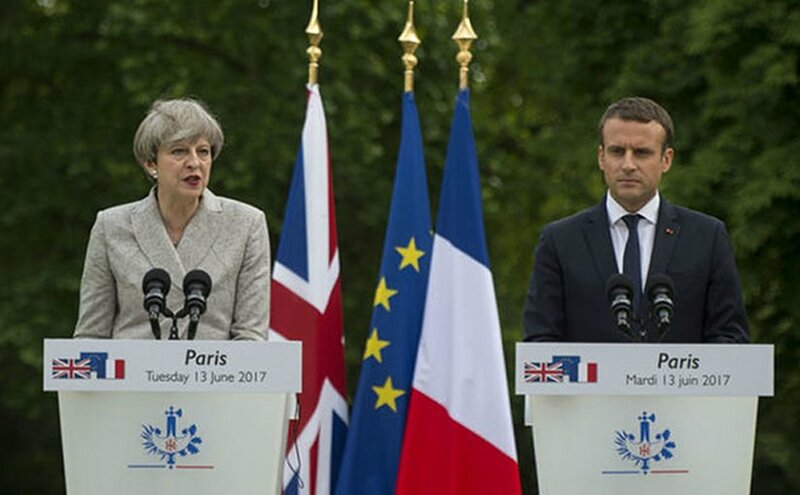 United Kingdom’s Prime Minister Theresa May with France’s President Emmanuel Macron. Photo Credit: UK Prime Minister’s Office. The European Union is united, up to a point, in its support for Macron. Equally important, Macron is determined to crush street protests and sporadic, partial strikes with demagogic appeals through the corporate mass media, coercion and outright state repression. The political party opposition, led by the left socialists and the nationalists, is divided. The Socialist Party barely exists. Pensioners and students are opposed to Macron, but have not taken to the streets. Few among the professional class and liberal academia retain any illusions about the ‘new centrist President’ but few are willing to actively confront the ‘the new Bonaparte’. Macron has fashioned a formidable alliance between the state apparatus and the business ruling class to crush worker opposition. But popular opposition is growing and is furious at his agenda and insults: ‘They (French workers) have had it too good…’ To defeat Macron, they must unite the opposition and build a strategy of prolonged class warfare. Macron will not give in to transitory strikes. If Macron’s capitalist offensive succeeds, it will have enormous implications for the French working class, especially the rights of workers and salaried employees to organize and struggle. A victory for Macron will profoundly undermine the structure and membership of popular organizations, now and in the future. Moreover, a defeat for French workers will reverberate throughout the EU and beyond. Conversely, a victory for labor could trigger mass struggles across Europe. A powerful opposition could confront President Trump’s capitalist offensive, but it will not be led by the highly bureaucratized trade unions representing less than 8% of the private sector labor force. Trump’s enemies among the Democratic and Republican Party elite have dismissed Trump’s ‘working class’ supporters as ‘white supremacist and neo-Nazis’. American workers’ concerns have been trivialized and marginalized by the divisive politics of ‘identity’, so blatantly used by both parties. Trump’s capitalist offensive in favor of a regressive pro-corporate tax cuts and the gutting of social welfare (health, education, housing, environment and worker safety) has failed to provoke sustained, unified social opposition. In the US, the pro-business elites dominate and dictate the agendas of both the incumbent Trump regime and the ‘elite opposition forces’. The official ‘anti-Trump opposition’, which terms itself a ‘resistance’, promotes ‘identity’ interests linked to elite political representation. It works hard to undermine any possibility of working class unity based on common socio-economic interests by focusing on marginal and divisive issues. In the midst of mass poverty, declining life expectancy and an epidemic of suicide and drug overdose deaths, the ‘resistance’ forces of the elite opposition concentrate on manufactured foreign (‘Russia-gate’) conspiracies and life style issues (trans-genders in the US Special Forces) to overthrow the Trump regime. They have no intention to forge any class alliances that might threaten Trump’s regressive capitalist agenda. The struggle this fall in the US will not be between labor and capital: It will spotlight the contradiction between what remains of Trump’s business protectionist agenda and the Democrats’ neo-liberal free trade policies. The capitalist offensive against labor in the USA was already determined by default. US trade union officials are marginal and inconsequential actors, incapable and unwilling to politicize, educate and mobilize workers. Trump’s capitalist offensive appeals to investors and boosts the stock market. The majority of his economic team is tied to Wall Street bankers against so-called economic nationalists. Trump’s mindless chauvinist rhetoric to the populace is openly dismissed by the plutocrats within his own cabinet, who complain they have been targeted by ‘fascists and anti-Semites’ (meaning Trump’s deplorable and angry voter base). The United States is the only country in the industrial world launching a massive, sustained capitalist offensive without an anti-capitalist opposition. The American working class is openly ‘deplored’ by the major elements of the elite opposition and blatantly manipulated by its fake ‘champion’, Trump. The consequences are pre-determined. The capitalist offensive cannot lose; both capitalist sides ‘win’. Under the Businessman-President Trump, multi-national corporations will secure lower taxes and degrade working class living standards and social benefits. Bi-partisan agreements will ensure that banks are completely deregulated. The elite anti-Trump opposition will ensure that ‘their’ capitalists get favorable neo-liberal trade agreements, guaranteeing their access to cheap immigrant labor and a non-unionized workforce denied workplace safety and environmental regulations. While France and Brazil face real class war, the ‘classless’ US slouches toward nuclear war. Macron confronts militant trade unions, Temer faces the fury of broad social alliances, and Donald Trump marches after ‘his Generals’ to nuclear conflagration. He invades Russian diplomatic properties; points nuclear weapons at Moscow and Beijing; holds massive offensive exercises and stations THAAD missiles on the border of North Korea; and escalates US air and ground force operations in a 16-year losing war in Afghanistan. Workers in Europe and Latin America choose to fight capitalists in defense of their class interests, while US workers have become passive spectators to the looming possibility of nuclear war, when they are not in a prescription-induced opioid stupor. Defeating the capitalist offensive in France and Brazil can advance the cause of social justice and ensure concrete benefits for workers and masses of people; Trump’s unopposed capitalist military offensive will send clouds of nuclear ashes across the world.